We analysed the results of five patients showing both a bull’s-eye maculopathy, as well as a negative scotopic ERG evoked by a bright flash. Their median age was 39 years (range 11–63 years): three males and two females. 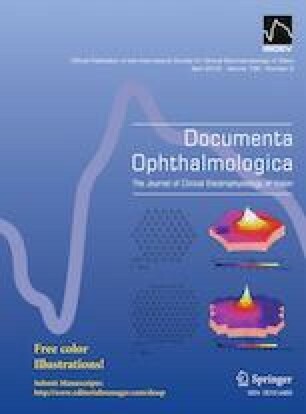 All underwent a comprehensive examination with determination of distant visual acuity (ETDRS) and recording of the full-field ERG (scotopic and photopic). Fundus, OCT, and FAF images were obtained, the kinetic visual field was determined, and colour vision (D-15) was tested in most patients. Targeted gene panel sequencing was performed on peripheral blood. We thank Dr. Kaoru Fujinami for his assistance. The study was supported by grants from the German Research Council (DFG Excellence Center EXC307) to EZ, and from the Tistou and Charlotte Kerstan Foundation to FN and AK. All authors certify that they have no affiliations with or involvement in any organisation or entity with any financial interest (such as honoraria; educational grants; participation in speakers’ bureaus; membership, employment, consultancies, stock ownership, or other equity interest; and expert testimony or patent-licensing arrangements), or non-financial interest (such as personal or professional relationships, affiliations, knowledge or beliefs) in the subject matter or materials discussed in this manuscript. Written informed consent was obtained from all adult patients and parents/guardians of minors.